There is nothing I enjoy more than sipping a good cup of coffee and people watching or catching up with friends on the weekend. Aah. In fact, cafe-hopping has become one of my favourite pass times and I am always on the look out for new brunch spots in the local area. It should count as a hobby right? Manchester's Northern Quarter is practically bursting with coffee shops however Fig + Sparrow's combination of trendy homeware items and wholesome food definitely gives it the edge. 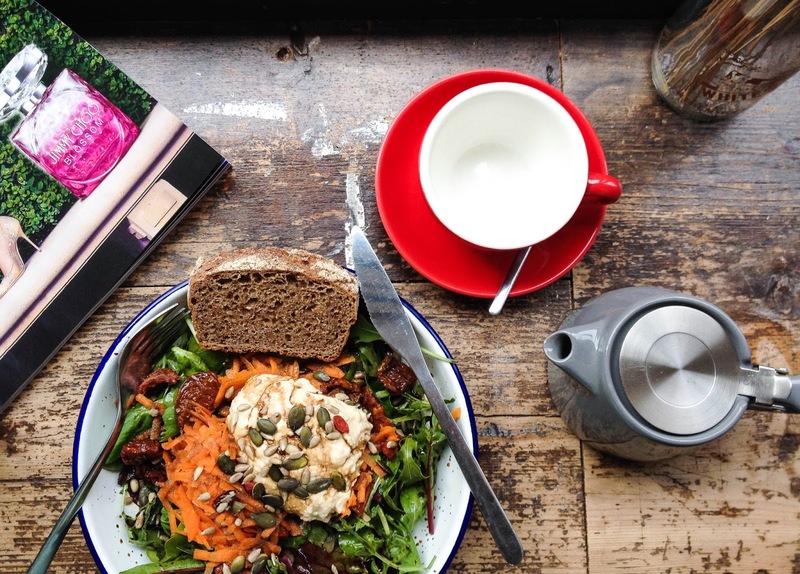 Located on Oldham Street (just off Piccadilly Gardens), this charming cafe and lifestyle store is the perfect spot to grab a bite to eat any day of the week. I would often stop here for lunch after a busy morning of lectures and it still remains a go-to whenever I am back in the city. The all-day breakfast menu features the usual suspects (porridge, granola, smoked salmon, etc) however the Houmous, Shredded Carrot and Sun-dried Tomato Salad with a slice of locally baked rye bread is my absolute favourite for lunch. The seasonal soups are also delicious and perfect when it's chilly outside - which is a little too often in this rainy city. If you are simply looking for a caffeine fix, the coffee is excellent, the tea menu is equally impressive and there is a marvellous selection of non-dairy milks on offer if dairy is not your thing (win!). If you happen to be visiting Manchester, I highly recommend stopping by Fig + Sparrow (even if it is just to browse through the beautiful range of homeware) but don't be surprised if it's a little crowded on the weekends as it's certainly popular with the locals too! This looks so delicious! Have a fab Sunday girl! Sounds like a great place, I wish I was closer ( as in not across the ocean) . I love your blog by the way, its so cute! !